$549 U.S. or £499 U.K. These are the best ultra-premium headphones you have not yet heard. If you can afford them, get them today. If they are beyond your immediate financial reach, start saving. 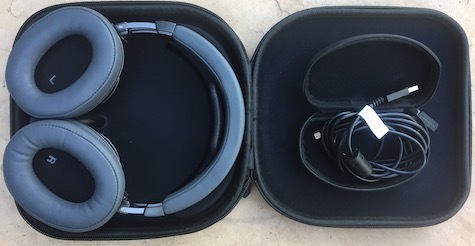 Pro and recreational listeners will enjoy these over ear headphones via both Bluetooth wireless and USB cable computer connections. The physical appearance of ATH-DSRBT is understated and classy, with stylish grays and silvers. The build quality is super-solid. A sturdy zippered travel and storage case is provided that fits ATH-DSR9BT perfectly when the earpieces are folded flat. A custom micro-USB cable with its own zippered case is the only other accessory, and there is a dedicated space within the headphone case for storing the cable + case. Bluetooth pairing with your iPhone, iPad, or Macintosh is immediate. The signal is constant and strong. The enormous wireless range is up to 50 feet indoors with walls and over 50 feet outdoors and inside with clear line of sight. USB wired setup to your Mac is effortless, as described in the thorough printed manual written in eleven languages. Audio performance is stellar. Bluetooth bass response is smooth, blending gently into the midrange without any peaks or valleys. Midrange and treble are world class, offering a natural, uncolored sonic experience that is immersive. Volume output is efficient, meaning be careful you don’t damage your ears with volume levels that are unsafe. I recommend setting the headphones’ volume all the way to the top and adjusting playback level on your source device. There is no distortion from ATH-DSR9BT. If you wear glasses, be aware there is some pressure from the large ear cups on the temple segments of your spectacles. Over time you’ll figure out the best spot to tip your specs up slightly so you can see while you are using these Audio-Technica gems. 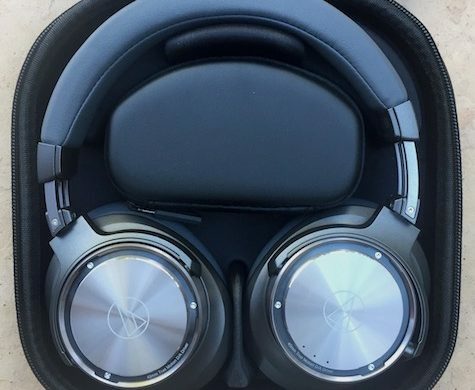 The fit of the ear pieces and cushioned upper head band are snug out of the box on my medium-sized skull, so you may need to stretch the frame slightly with padded socks or t-shirts until you achieve a comfortable fit. Whatever you have to do is worth the effort. Battery performance and duration are fabulous. I keep thinking these headphones will run out of power, and they rarely do. I use them for hours, day after day, on a single charge. Well done, Audio-Technica battery department. Ambient passive sound isolation is average, meaning nothing special when sound output is low and external noise is high. This company makes excellent active noise-cancelling wired headphones with a similar design that sound really good. Here are two links with additional information. 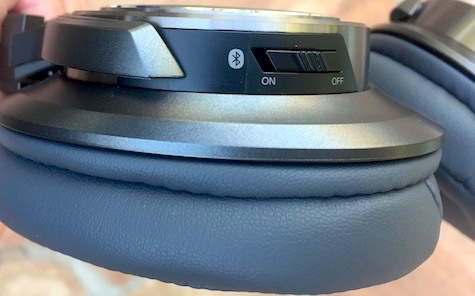 I listened wirelessly to hundreds of tracks from all genres while evaluating these premium headphones. Everything sounds better than I’ve heard previously using Bluetooth. One noteworthy example is the remastered version of The Beatles’ Here Comes The Sun. There is a lot going on in this well-known song that I never experienced previously, and the overall effect is stunning. Other rich-sounding demo tunes include Never Together by Jonathan Edwards, Heartbreak Radio by Roy Orbison, When Will I Be Loved by the Everly Brothers, and Where Were You Last Night by the Traveling Wilburys. Bonus! People who listen with headphones while using a computer are in for a treat. 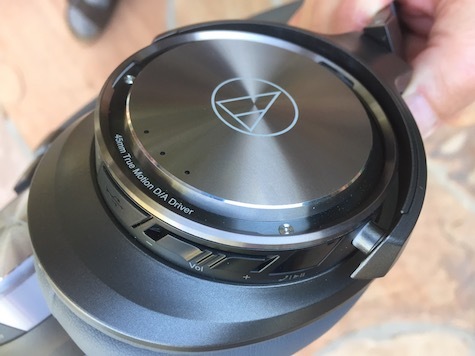 ATH-DSR9BT’s Pure Digital Drive sound signature is more precise with the USB cable than it is with the excellent wireless Bluetooth connection. Bass performance is jaw-dropping. 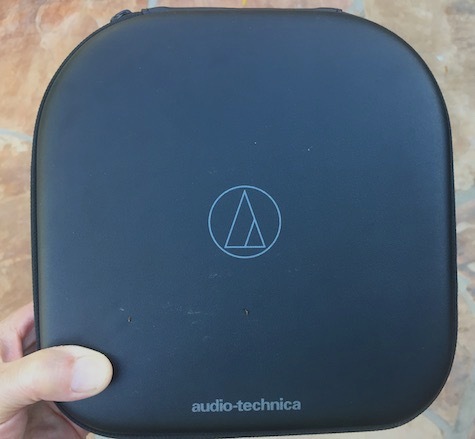 There is a crispness to this all-digital audio signal that is superior even to Audio-Technica’s ultra-premium ATH-A2000Z analog audiophile headphones costing $100 more. Never Going Back Again by Fleetwood Mac, Cloudy Days by Alison Krauss and Union Station, Everything Must Change by Karrin Allyson, Boots of Spanish Leather by Nanci Griffith, Next Fool by Marley’s Ghost, Father of Heaven by Kathleen Ferrier, and General Taylor by Great Big Sea. Pure Digital Drive enhances accuracy and punch, versus analog audio’s smoothness and traditional integrity. The all-digital signal differentiates legacy and remix versus contemporary digital recordings. Digital drive is immersive and intense, with depth, breadth, and sonic layers, plus bass delivering more impact and presence. MyMac Review Rating is 9 out of 10 for the fortunate people able to purchase Audio-Technica’s ATH-DSR9BT headphones.